Tsuki Adventure is a unique game by Hyperbeard where you will explore the village, city, fishing spots, and many more places. The main character in this game is Tsuki itself. At the start of the game, you find Tuski in the office, irritated by his colleagues. And later, you get the letter from Grandpa in which he mentioned the tree house and little carrot farm. That’s your home – Old Tree House, In the mushroom village. After it, Tsuki resigns from the job and moved to the mentioned place by train. There you met with Mari who will guide you; carrot harvesting, buying items from the Yari’s shop, and much more. Overall, it’s a good game with decent graphics, story-line. However, it’s not a fast-paced game; discovering new places, items take days. 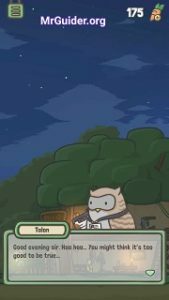 If you have just started playing it and have no idea how things work in Tsuki Adventure game, then our Tuski Adventure guide and Tsuki Adventure tips, cheats & strategy will help you. 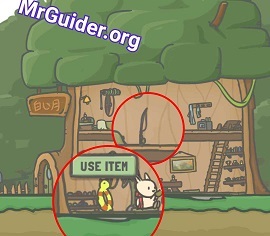 The tutorial will leave you to the Yari’s shop where you will be able to buy items in exchange for carrots. Buy the fishing rod as it will help you to catch the fish. If you have already spent the carrots on other items, then harvest the carrots again from little carrot farm. To switch between screen, swipe left/right and tap the icon at the bottom left/right. Three main things in this game are Carrots, items, and the timing. You can use carrots to buy items. But keep in mind that not all the items are usable. You can use some items to complete the Tsuki’s Diary, while some items are used by Tsuki automatically. After buying an item, you may use it and complete the diary’s memories. For example – Fishing rod, Ducky Float, and more. In the tree house, look for the item which you have bought from the Yari’s shop. Tap it -> use item. For example: – To catch the fish, tap the fishing rod in the tree house. Note: Only certain items can be used. To travel to the city, you need a golden ticket. You can buy it in the village’s shop and it will cost you one thousand carrots. You will also complete one of the memories. Tsuki will take almost 8-9 hours(Real-time) to reach the city. After 3 days, Tsuki will come back to the mushroom village. In the great city, you can buy expensive items such as car key, VIP Card, and more from the great mart. At night, you could interact with the guys playing cards in the hotel and earn carrots. It’s all about timings. Everytime you open the game after being offline for hours, you may find a different scene. That’s why the developers have stated it as a passive adventure game. You don’t need to be online all day. Open it in morning, afternoon, evening, night, late at night. Yukiyama is the new place where Tsuki can visit. The developers added this place in the latest update(Arrived today on Android and iOS). To visit Yukiyama, you have to buy Yukiyama ticket. It costs you 1000 carrots. However, you should go with more stock to shop items. Since the update has arrived today, we can not tell you the exact journey time(It’s 6 Hours :D) and the cost of items(make sure to check the comments below for further details). After buying the ticket, wait for Jasper, the wolf(appears near panda shop). Wait until the late night(In my game, it appeared at 10:00 PM~). Tap him and he will ask you for the Yukiyama ticket. Follow the on-screen instructions to board the bus. You will also unlock a new diary entry. TSUKI IS NOT GOING BACK TO VILLAGE! When you first time travel to the great city, the game tells you that Tsuki will come back to the village after 3 days. But there are many players facing the issue that Tsuki is not going back. This could be a bug or it works automatically. If you want to go back to the village, then use the code; Countryroad. Go to the options menu -> tap the safe at the bottom-right corner. Enter countryroad. That’s it. It should work. If even this is not working, then contact the developers. Like other Hyperbeard games, Tsuki Adventure also features lots of items/toys. You get these toys from Gachaboy who is near the Yari’s shop. You can gacha tickets from the village’s shop. If you have, tap the Gachaboy and choose “Okay Gimme”. Sharing the item will reward you carrots. If you discovered Tsuki Flying the kite – There would be a small pond on the right side. Sometimes a duck appears (SOMETIMES). Interact with the duck to get eggs. You can sell these eggs in the village’s shop for carrots. Tsuki500, Yaytsuki, Countryroad. Thanks to all those who provided these codes in the comment section. Update – These codes are now expired and do not work at all. You can get the codes from Hyperbeard’s social media pages; Facebook and Instagram. To enter the code, tap the menu button -> options -> tap the safe icon at the bottom-right corner. So that’s all for now as Tsuki Adventure guide. Let’s read our top Tsuki Adventure tips, cheats & strategy. If you explore a bit, you will find the characters near you. For example; Ken, Bobo, Mari, Snow, and more. Talk to them daily; even multiple times a day. This will increase the friendship and you could get free carrots as a reward. For example – Ken could gift carrots, you may get upon answering some questions and making the right choices. After buying the fishing rod, use it. The game will teleport you to the fishing spot where Tsuki will catch the fish. When you see (i) sign, tap Tsuki to hook the fish or item. You can sell the fish in the shop to get carrots. However, other items such as boot, the bottle do not worth. Sometimes, you get the Ad offer from the characters. For example; From an Owl, Giraffe. Accept it if you want free carrots. Always read the story-lines to make the right choices. As mentioned above, after being offline for hours, you may discover a new activity. We would recommend you to must open the game in early morning, morning, afternoon, evening, night, late at night. You will discover new diary entries as you buy and use more items. Sometimes, Tsuki automatically uses the item. For example – Carrot Chips. You may find Tsuki eating these chips in the tree house. So that’s all for now as Tsuki Adventure tips. If you have discovered something new in the game, share in the comment section. It will help others too. I recommend saving up carrots before buying a ticket to the city since the carrots which you get through the mail from your village friends disappear after a while unlike how in the village, the giant carrot will always be available to pick up when ready. Buy monster catcher to catch the beetles. To use the monster catcher, go to the tree house and you will find it near the Tsuki’s bed. Tap it and use. To get the eggs, go to pond side using the monster catcher. There you will find a 🦆. It appears often. Tap it multiple times. That duck could drop an egg randomly. @Jessi Tsuki will eat automatically. @Flamingchasi thanks. This code gave me 1000 carrots. My tsuki is on its way back to the village from the city via bullet train 😅. In the city i bought the lord of the carrots 2 that Chi has been asking for. I also has met Bobo’s brother but i could not befriend him easily because im not sure he will show up at what time. I also noticed that if you have 1000 carrots in the city you will stay in presidential suite but if u have lower than 1000 carrots u will stay in cubicle hotel where u will find an elephant to play poker with. At the city, i accidentally bought Arcade VIP Card for 250carrots. They said i could get an unlimited access to BEON arcade. But i couldnt find anything to play in those arcade. Any help? @Fey You can use it in the Beon, at the first floor, by tapping Kimbo who is boxing. Arcade card is needed to join him. What do I do with all the stinky boots and bottles I fish out while fishing? Is there any way to get money from selling them or are they useless? @Sam As of now, there is no purpose for either the boots or bottles. I kept them in my inventory for almost 2 weeks and nothing has happened so far. You can’t get money/carrots from them at any shop either. Unless it gets updated and a purpose for them is added, I can’t be sure. I am staying at the Presidential Suite but I can’t get to the bar to play Poker with the elephant. Is only when I leave the app and at times go in again at night then Tsuki already there. Once I leave the place, I can’t get there again. Is it suppose to be like this? Tsuki is not going back to village and it’s been 8 days at great city already. I keep hearing about going up the mountain to Rondos (I can’t remember the other thing), where is that? Go back to the village with safecode countryroad. Then you don’t have to take an eight hour train ride. Does anyone have issues getting carrots from this free offer deals ? I have been in The greatt city for 4 real days now. How do I get back to mushroom village? @Yeheybananas The game decides when you get to go back to the village. You can go back to the village with safecode countryroad. You don’t have to wait or go on the 8 hour train ride. Don’t play poker in the city. You don’t ever win. @琼晶 Spend some days in the game, it will automatically get unlocked. @MP Thanks MP, this code is working. Mu Tsuki is now back to village 😀. But it’s not working in old version of the game. You will need to update and then enter countryroad in safecode popup in option menu. You can have 100 carrots for watching an add by talking to the horse while staying in Presidential suite. In can be happen if you have at least 1000 carrots on your wallet. But, i noticed that you can be friend with someone on the bar at budget room. Just buy something and make your carrot less than 1000 to get the cheap room. I got boxing gloves from Boho’s brother. Good luck. Be friend with boho, he’ll give you a bow. Then you can go to dojo. Or sometimes, tsuki just suddenly appear in dojo in the morning. first two code were tried in old update Not sure they work in latest. guys how do you get the boxing thing? also how much is an iphone in the big city market? how many carrots do u recconend bringing to the big city market? @mellowmew I mean the store is on the left of geisha bar. It’s always close ^^! Should we try to buy everything from the shop in the city too? Seems like mostly the items are modern tools like smartphone, TV, laptop, even a car, which seems a bit contradictory to the whole point of Tsuki going to live at the village. I think the description for the TV even says something about mindless entertainment for your brain or sth ‘negative’ like that. If you befriend the bartender at the capsule hotel bar, he will give you a pack of cards to remind you of him. He also tells you that he’s planning on travelling and visiting your village. Not sure if the card is useful in the village or he will actually visit though, my Tsuki is still in the city for now. Buying the kite helps you to go to the park. I have been in the city too long and came here to get tips. Thanks for the codes. At the Presidencial Suite, the horse sometimes does not ask you for your time (*´∇｀) I got gloves from Kimbo the panda bear and went out for some dessert with him. How do I get gacha tickets? What is the store next to the bar. Is it something that I can get with enough carrots? You can get them from the shop in mushroom village. I use the golden ticket it seems that i am stock at the train station does it take 8 hours to go to the city? Only countryroad works, can anyone give me codes that still work for them as soon as possible? My Tsuki is now sitting at what appears to be a train station of the Great City. I’m guessing he’s boarding the train (looks like a bullet train and not the more old-timey train he got on to come to the city) and going back to the village soon but sadly there is no new diary entry about this (so far). How do we know that tsuki has befriended a character? Every character has a different coloured heart beside the messages. What does those colors signify? does anyone knows something about the golden pages in tsuki´s diary? @Reyna the hearts are the friendship level. Red is the highest. Can anyone tell me how to get the beon arcade card? @Reyna you get beon arcade card from the great mall in the city. Deals in the shop refreshed every certain amount of time. When do we get to buy the ticket to the city? iloverabbits will give you 1000 carrots! So I bought my ticket to the city, now how do I use it?? How to get all 5 stars of the carrots growing? I have only 3 and nothing happens…. how do i meet frank to buy the ticket to leave the village? what will momo give me when we’re friends? how do i unlock the hardware store? How often can you use the codes? Is it just for one time use only? The card game in the city is based on reaction speed. If you click the second the ! Shows up your odds increase. Usually I get 5 or 6 in a row then one loss. Then quite a few wins again. If I get two loses in a row I quit and come back later, mostly because I’m afraid they program the odds to change as you play. Though it may also be reaction time slowing down as I play. I don’t know for sure but it wis working well enough for me this way. Good luck. @Lisa_S One time only. However, the countryroad code works multiple times. @Anonymous To use the ticket, tap Frank(Dog) near the pole(utility pole). He will ask for the golden ticket. Choose “Here You Go” option and that’s it. After an hour, you will be on the train. Is there a code to make tsuki go to the great city without waiting 8 hours? if I go back to the village, money I collect while in town will disappear? How do I get the hardware store? To win card game, click only bartender turn left, if lose, change to click when bartender turn right. 80% be winner, GOODLUCK!!! What is the purpose of the building with the saw on it? How do you unlock it? You need 1000 to get to the city. Once there, if you want to buy all the items, I’d say bring at least 25000, perhaps a little bit more. Selling fish or eggs is a good way to make more money. While playing cards I don’t think it’s reaction time. I’ve hit later and won and right on and lost. And vise versa. Also someone said about which way Clive the bartender is facing which is also inconsistent. The conclusion I came to is just that of learning the game. When Tsuki first starts playing I lost like 10 times in a row and the more I play the more I win. So he slowly gets better the longer you stay at the table to play. Now I will get 5-6-7 in a row before a lose. Givin Krieger and Rahul a run for there 🥕’s! Have fun guys. I confirm what the article said: Ken can give you carrots, a thousand to be precise. I always gave him carrots when he asked me and before giving me back the carrots he asked me if I remember how many I had given him. No need to know. Also at the very beginning of my journey, he let me in the bar once, but never did it again (though some times I could see Tsuki drinking at the bar but without having done anything). Is it the same for you guys? I’m looking to see if anyone have an idea about this. I get offered those fertilizer bags and i’d use it on the carrot but i can only reach 3 stars before it resets again the next day. Is there a way to continue increasing the star? Is there a specific reward if it gets to 5 star? Does the cow(?) only come once a day? @Miva I haven’t tried this myself but once I saved the fertilizers up and when the cow came again, I thought I could stack the gift and get 6 fertilizers (I know it says MAX but I thought maybe there would be another stack beside it or sth) but nope. You can only have 3 at a time. I’m thinking next time I will save the 3 fertilizers, wait until the cow comes again, and I will first use the previous 3 up without harvesting the carrot, then watch the ad to get 3 more and use those immediately to hopefully get 5 stars. You’ll unlock a new diary when you get 5 stars, the biggest carrot ever, it said. Try to have red heart with girrafe and turtle, it will add a new diary, a scene where the three of them are gossiping people in village. Good luck. Yeah, it will work. I’ve did the same thing. To get all 5 stars with fertilizer, save the first MAX. Then when Wygu offer come comes again, use the first 3 saved, except the waiting offer from Wygu and use the next 2. This will give you the max amount of 5 stars. Each Star is worth 20 carrots. Using the max of 5 Stars will give 100 carrots. It will not give anything extra so it really doesn’t benefit waiting but fun to collect that way. How do I get the 5 star carrot? Wagyu came by once when my carrot was fully grown, but hasn’t since. Does he only come when the carrot is growing? Thanks guys, I’m curious to see the diary entry so I’ll wait for the cow to show up today. He didnt show up yesterday for me, maybe it was the timing? I didn’t really open it around the same time I saw him. It was pretty late (or too early). Hopefully I can get that 5 stars! @dave z, Wagyu usually come at the morning (around 6AM to 8AM) maybe earlier or late. Anyone has ever seen the thief at night? Stuff in the city is expensive af and I was not prepared lol. So far i have 44/54 diary entries. Talk to everyone who has heart on their talking bubble. If the heart turns to red color it means the character becomes your friend. You will get firework from the fox (i don’t know how to use it), bullseye (bow) from bobo, house shaped clock from moca (don’t know how to use it either), boxing gloves from kimbo, and 1000 carrots from ken (he says those are the carrot he lend you) lol. Did you talk to the bartender in the city? I have visited the great city twice and both stayed in presidential suites 😅 i didn’t have enough carrot to buy remote control, laptop, and car key but not poor enough to stayed in capsule hotel 😅 so i didn’t talk to the bartender. I’ve seen a video in youtube that tsuki and the bartender talked about detective. Do you know what is it? From my second visit in town and when you’re staying at the expensive hotel, it seems you are sent to the cheap hotel when you play during the night, after midnight I think. I’ve just arrived in town to buy the car, I’ll try to go talk to the bartender. Town is pretty boring… nothing to do. I almost miss fishing. @Lamba Use the kite or monster catcher item. This will send you to the pond side(at the right side of that screen there is a small pond). There you may interact with a duck in morning or evening. However, after the update I have not seen it. Message in a bottle seems only there to be sold. It is not a unique item. The duck comes and goes. Fishing will get you money faster if you’re ready to tap on your screen for a few hours (not necessarily at once). Just go fishing and keep taping, no need to look at the screen. Do it while watching a film for example. Hello! What does each color of the heart mean? What special thing can the gloves give me? Hi guys, so the only characters that can be interact and progress in the city are Kimbo and the bartender, right? Not much to do in the city except gambling. Btw, you can get negative carrots when you gambled and lost. I thought having only 5 carrots is safe and only earn but nah. Hope there will be update soon! When Chi asked me for the book, i already had it so i gave it to him, but now Chi still keeps asking me for the book. Does this mean I need to buy another one to give to him again? I have the book but Chi never asks me for it! And when I first played the game, Bobo would regularly ask me for a duck egg, but back then I didn’t have the kite or bug catcher yet so I didn’t know how to get that. I went to the city once and since then he never asks me for the egg anymore. Does giving Chi the book and Bobo the egg unlock diary entries? Both of their hearts are already red. Also, the bartender told me that he heard that a detective named Sherlock was in the city investigating alien life. I think I saw Sherlock, there was a big bear in a trench coat walking around among the others in the city sometimes, but I couldn’t talk to him. When I tapped him nothing happens. Does Tsuki actually use the things you buy from the city? Yes and it will get you some diary entries. clown fish can be selled for 50 carrots! In the Dojo, I see that one can fire the arrow as Tsuki slowly raises his bow – but I don’t know how to get him into Kai (full power). Does anyone else have the answer for using the bow properly? What’s the purpose of the saw house? If you complete the 5 stars of your crops (with the fertilizer) you have a new entry, plus you get a super giant carrot! I gave chi the book, she didn’t return it and ask for it again. Is this a bug?? Idk how to give chi the book I bought in the city, help pls??? So I think once you get the red heart with bobo, he no longer asks you for the duck egg. Which stinks because now I finally have it for him. Do not buy your toys in the city. Twice I got some I already had. It never happened in the village. If you want to increase carrots in short term, after collect carrots you just set after that 2 hours (sometimes you can meet Wagyu for free fertilizer). But it will lost the meaning of this passive game. @Anounymous_ChiBook Chi will ask for the book randomly. Go to fishing and interact with Chi. Hi! does the monster catcher actually catch beetles? i tried it a lot of times but i caught nothing..
How fertiliser helps in carrot harvesting? @Elisa Nope. It just unlocks a dairy entry. That’s all! I had a little over 1100 carrots and almost 7000 of them have gone missing. What can I do about getting them back? I declined Ken’s offer for 1000 carrots because I assumed he’d give them to me anyway 🙁 any idea if I’ll get the chance to accept them another night? Ken keeps asking me for carrots, although he already paid 1000 carrots back to me. Will I get another 1000 carrots from him at some point? Does anyone know what to do when you stay at the presidential suite? I have like 1500 carrots and I can go into the shop and interact with one person at the mall and interact with people passing by. As well as that, I can interact with the person at the presidential suite. Does anyone know what to do? Does the person at the suite tell you about the detective or something? The chat at the presidential suite asks you if you will stay in the hotel. What happens if you say No? Does giving the panda the egg and giving the giraffe the book give you a diary entry? Because I’ve already full on red-heart befriended them and they no longer ask for it. I’m now on 44/54 diary entries and I hope the missing 10 are all city things. I think the Detective you guys are talking about is the bear man with a long coat and a hat. I can’t make him talk to me even though I click him like a thousand times whenever I saw him passing by. I’ve become friend with bobo (panda at the ramen store) but he never asked me for the duck egg. What should i do? Everytime i clicked him he just offered me some ramen or talked about his family. So far i’ve unlocked 48 diary entries. Now i’m saving up the carrots to buy all stuffs in the city that hopefully can fulfill my diaries. Does anybody know can I catch insects or something else with the monster catcher? And in my inventory next to the “Monster Catcher” there is number “(6)” , what does it mean? Please somebody tell me! And I haven’t got anything with the monster catcher yet, there’s nothing in my inventory that I maybe got with the monster catcher. And the promo codes that everybody says that they work, they don’t work with me. Only the “Countryroad” works. Maybe they worked only on december? I saw a thief at night and it was a raccoon. It didn’t unlock any diary, it just give you extra carrot. You can unlock “The story of the light house ” by touching the light house board. Or “Chilling by the lake” and “Chill by the lake” by laying by the lake with Chi and bring your ukulele to the lake. How did you get the thief at night? Did you play at night or what? Let’s try to make a list of things you can get. Did you find other items of fish ? You should play at night. You can see Tsuki doing things, get some carrots or some diary entries. the codes do not work for me, HELP!!!. I was missing 4 diary pages, I’m now missing 40! By the way does anyone have managed to get the car diary page? Are there more than two new items at Yori’s? The camera is funny, too bad we can’t keep the pictures in the game. Is Bus ticket only 9am or 10pm? Are there new items in the city? So I just opened up my game and Tsuki was driving somewhere in his car I bought him?? Does anyone know where he’s going? Does anyone have tips about Yukiyama? I think it’s a seasonal thing, but I just got another diary entry from buy a ticket and talking to the dog to go to Yukiyama. They just updated the game, there are now 90 total entries to find and a Yukiyama city to go to. They also have some new items, like a Polaroid camera. You can do fishing in Yukiyama place and earn carrots. Go to the screen where Tsuki sleeps(left side). Tap the fishing rod near bed and go to fishing. Catch fish and sell in the Pakku’s shop for carrots. And today In the night, Tsuki was taking a hot drink in the room and one charcater named Maska(dont know the exact name though) came and ask for the help. I helped by letting him come in the house. After that I dont know what exactly happened but he said I am taking away ur carrots. 😐😐😐Then he runs away, I didnt checked the carrots So I cant tell you whether I lost some carrots or not. Are there a lot of objects to buy in Yukiyama? I feel like fishing on Yukiyama is a bad idea – the police officer and the pedestrians all mention that fishing is illegal. I think if you’re caught, it might hinder your relationship with the officer. Fishing in Yukiyama unlocks a new diary entry called ice fishing. There are 2 weasels: I don’t remember the name of the had one, but the good one is definitely named Masako. Just a warning though, the bad one might be named Masako, too. One will steal your carrots, the other will give you carrots. It’s 50 whether he takes or gives. @Anonymous You were right! One more thing I would like to add is to go on fishing when Pakku(Rooster) is also there. Otherwise, Sherrif Inu will come there and you will be fined(50 carrots). Thanks for all the details. I’ll continue to fish before going to Yukihama. Has anyone gone back to the first city since the update? Why cant i se my fishing rod while staying in Yukihama?? @Anonymous: Me, I keep on tapping the duck but he just said quack twice, never talked again and never gave me any egg. The only egg I had in my inventory also went missing. In Yukiyama, you have to go fishing at night! Click on your fishing rod on the left side of Tsuki’s bedroom and it will teleport you to the fishing place. Pakku will be there as well so you can also interact with him while fishing. Don’t go there during the day because Sherriff Inu will always be around and you’ll be fined (50 carrots) if you get caught by him. I still have my eggs found before the update, but indeed it is difficult to tap the duck now. @bill how can I go fishing in yukiyama? I can’t see any fishrod in my hotel. Could be like in the big city where according to the number of carrots you will stay at different places and be able to do different things? @Rara, you have to buy the ice pick (1200 carrots, I think, but don’t quote me on it!!) to fish at Yukihama. Then the fishing pole will be in your room. I guess he uses the pick to make his own hole? Regardless of the reason, that’s how that works. My heart level for Pakku is still stuck at yellow. How long do you think Tsuki will stay at the mountain? I had an error on my 2nd day while in Yukihama, when I came back to fish Tsuki is already in his home in village sleeping. I thought it was natural so I just went on to chat with Ken and shopping at Yori’s shop. When I came back later he’s in Yukihama again lol. The items I bought at Yori’s still in my inventory. – Buy two to three instant noodle cups in the village because these mountain dwellers go buckwild for them. Again, though, these don’t seem entirely necessary to earn their affection. – Bring with you about 10,000 carrots. There’s a couple high ticket items you can buy here. But you can always sell fish you catch there (after buying that 1200 carrot ice pick, of course). Omg you’re right. As soon as i got the icepick the fishing rod is there! Thanks!! Why does everyone at Yukiyama want cup noodles? The sherriff wants some and the monkey in the onsen wants some. The monkey also wants to play cards, if you have a deck, you can do so. I finally got one of those yellow ball to get a special toy (some poison for that one). I like the idea to buy some toys to make the ball go down, but nine balls for one ne item? That’s a lot. Does anybody make a friendship with characters from Yukiyama (Jun, Pakku, Inu)? Maybe they will ask for something, like characters in Village asked (egg, Lord of the Carrots 2)? As I understood, they ask before the heart goes red. And never after 🙁 So, I want to be prepared. Or I’m wrong with this theory? @Peter: Prepare lots of cup noodles that you can buy in Mushroom Village coz two characters will keep on asking you for them. I wasn’t prepared so when I got back home I bought at least 4 before I go back to Yukiyama. Bring at least 10,000 carrots to buy everything available in Pakku’s store. Jun will ask to play card game so it would be handy if you already got them from the bartender in the city. Today something strange happened. My Tsuki was in the village, don’t know what happened, I opened the game 3rd time, it takes me to the snow place automatically where Tsuki was skiing. A new diary entry downhill skiing got unlocked. And btw, the countryroad code still works for me. I wish I could explore more there. Has anyone played the mini-game? When I fished in the day time (for test purposes ) In addition to the 50 cartit fine my Tsuki was thoroughly thrashed by the Sheriff .. he was back in his Onsen room in the corner with a reddish glow fom the beating. Does anyone know what the different colored hearts mean? Bobo’s Heart used to be purple for me but now it’s yellow. A couple of the other characters hearts have changed colors as well. Guys, if there’s a dog-ish character appear in front of the Yukiyama dorm, DON’T open the door, it took 50 carrots away from me. You can fish in Yukiyama during the day, it’s just that you have to keep an eye out for the sheriff – make sure you leave before he reaches the ‘no fishing’ sign. You can get a lot of carrots by fishing in Yukiyama – even the “useless” items like seaweed, aluminium cans and driftwood can be sold for 1 carrot each. How do I get to the dojo? Since I arrived in Yukiyama, Uni asked me only once for cup noodles and Jun once too but for the spicy curry noodles! And he gave me a banana. In yukiyama you can sell the shoes and bottles that you earn when fishing, you sell them to 1 carrot in the store. How do you use the ski? I bought it some time ago but I don’t know how to use it. Help please? @tsukicutie In my case, my tsuki used it automatically whenI opened the game around 11 AM. If you fish in the daytime, Sheriff Inu may be walking around. You won’t get caught unless he walks past the ‘no fishing’ sign, so keep an eye on him! It’s safest to fish at night, and at night you can also befreind Pakku the penguin. ALso take a photo of the yellow duck on the pond and the giraffe knocking on your door. You will be rewarded a diary entry for each of it. Okay, so, I can make fast money in the village by fishing, but is there a way to make money outside the village? Other than harvesting, I mean. If you change the time on your cell phone you will get the carrots every 2 hours. and if you change the date on your cell phone you will get the bonus carrots for each time you log in. Thanks I lknew. I mentioned it because before coming to Yukiyama, I thought we only needed regular cup noodles. There is a (new?) horse character who visits the Grand Luxury Hotel during the day. He offers to “teach you how to invest” and you watch and ad for 100 carrots. I bought a car, how do I use it? Yukiyama – You can gain a diary entry by buying the ” Lord of the Carrots 3″ (forgotten whether it is 500 or 800 carrots) in Pakku’s store. Tsuki will read it in the onsen of the place he stay. I am stuck in the village I have bought the ticket but I got no diary entry and I cannot go to the great city,what do I do? Seaweed sells for 10 in the Mushroom Village. Guys, when you click Officer Inu and he ask if there’s any trouble, just click the upper option and then you can GO FISHING without worrying that he will fine you because he would be away. Different fish in daytime. I dont get to sell those rubbish items at 1 carrot though even if I sell in different location. To get to the Great City you see Frank the Conductor when he’s next to the Ramen shop. He’s there in the daytime. He’ll ask if you have a ticket. Why do you need to go to Yukiyama to get 15000. You can easily get them in the village with the carrots you get by watching the ads (around 1000 per day) and/or while fishing and selling the fish. And you also need 1000 to buy a ticket. It seems you can’t use the car. You’ll see it near your home. I read from one user that Tsuki randomly used the car to go to Yukiyama, went skiing. Tsuki went for a car ride during the night. No diary entry though. How to get to capsule hotel to talk to bartender when you’re staying at presidential suites? I found that Bobo keeps giving me red money packets if I continue to talk to him. Any new codes? @Spearit the red money packets are for Chinese New Year, which is coming up soon. It will probably go away later. 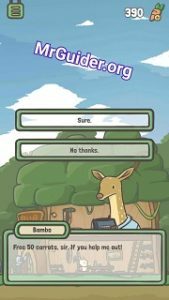 If you take a picture of bambo the deer who comes to ask you for help at your door and will give you 50 carrots, you get a new diary entry. Yes I understand that. I’ve made over 10k carrots from Bobo. Just spreading the word that he keeps handing then out. Who became friend with Inu and how? My game updated today and now the red packet bug from Bobo is fixed. I’m so sad I can’t go to the City!!! I declined the invitation many times because I wanted to save up carrots first before going. Now only Jasper appears to take me to the mountains. I don’t want to go to the mountains 🙁 I have already bought a golden ticket but there is no invitation to go to the city. What can I do? @Bianca it’s probably that you open the app at all the times Jasper is there. Jasper and Frank switch based on the times, so if you see Jasper, try waiting 15-30 (or even 45) minutes before going back into the app. Also, did anyone else know you can sell Gacha tickets for 50 carrots each? Yesterday, Tsuki got red packets(ang pau) from everyone( Bobo, Ken, Yori, Momo) in Mushroom Village. I’m not sure with characters in Yukiyama/Great City. I just bought the lunar new year snacks and there’s no diary entry. What is the red packet (ang pao) for? It’s only worth 5 carrots. Any idea? The red packet is for shaking :). Your friends gave you carrots. 50 each, I believe. Except for the bouncer, ken?… he put only 3 carrots inside, so you can sell his envelope for 5. None of the codes have worked for me 😔 (=u.u=) that thing keeps pooping up and I haven’t gotten anything. Also I just bought a firework from the Chinese New Year stand. How do I use it? Pissed I didn’t get a diary entry for spending 888 on a dragon! I bought carrot chips and got a diary entry from it. And I saw last night that tsuki brought friends to the house to eat the new year snacks. And one box gone after that. Too real. Maybe we should took a photo of the dragon? Taking a picture of the lion dancers (what you call a dragon) doesn’t do anything special. Has anyone seen Bambo during the Chinese New Year? For yukiyama village, the weasel called Masako or something, the one that either gives or takes 50 carrots from you has slightly different dialogue to differentiate. At least that’s how it’s been for me. Basically just watch for the tone, of bad Masako talks more on getting in your house while good Masako will politely ask. Yes, i saw bambo on momo’s teashop. I forgot if he was on my door or not. It’s a nice info. Thank you. Hi! I am not able to get the free carrots from the owl and the surveyor or the fertilizers from the cow. I used wifi connection. What do I do? Once you have Golden ticket, you Tap Frank(Dog, near Yari shop) and choose to visit great city. May sound like a dumb question but where are you entering all the codes? Buy more carrot chips and keep it in your items because I got 2 diary entries from it. One when tsuki ate and another when tsuki invited chi to come over and eat. @Anna Open the game -> at the top-left, tap the menu button -> options -> at the bottom-right, tap the safe and enter the code. Is there any way to get back to climbing the mountain after I accidentally pressed returned to the village in yukiyama? I’m finally at yukiyama now. I bought a carrotboy and it gave me a diary entry! Watch out when playing cards with Jun, you may also lost carrots like when you play in the city. Fishing at night here is much easier than in the village though.have yet to see the two masako thought one of the characters have been hinting me that one is bad. Which is the good masako? Hi Mary .. see Pengyu’s post on 2/7 ., it seems “it’s really cold outside, can I come in?’ is the giving Masako. In general the giving one is more polite about requesting to be let inside. @Saki5 thanks. Missed the comment! I encountered both the good and the bad one. The bad on the other day the good one just . The laptop that I bought from the city gives a diary entry in yukiyama. So cuteeeeee. @Gebrela Bilova still trying to be friends with him too. I think we just have to keep talking to him when there are options to click. Where exactly am I able to go fishing in Yukiyama? Update: pakku’s heart is blue now!! @Mary How many diary entries you have discovered so far? @Bill 65 diary entries! Gained two new ones today – when tsuki Went to eat soba in the restaurant and when tsuki Went to drink fermented carrot juice. Hello does anybody know how to use the fireworks and star shooter? It’s always in my bag. Does anyone know how to get the O.M.Burger diary entry? Does anyone know if selling fish or eggs or anything is the same price at all 3 cities/towns? The fireworks and star shooter are used when you open the game at certain times. The burger is the same deal. Does anyone know what will tsuki do with that mandarin orange? Are there certain times of day that work best for any of the random diary entries? I’m still missing “This is Life!” (cup noodles), Laundry Day, Chi and I (carrot chips), Blowing Bubbles, and The Best Night Ever! (I know this is a night thing, and I have Star Shooter, just wondering if a certain time of night is best?) from Mushroom Village and I’ve been playing for months. I’m also missing O.M.Burger and I’m on my last day in The Great City. I’m afraid I might have to come back a third time for just one diary entry lol. @Gebrela the mandarin oranges seem like they’re for display, you can see them In the house on that table with the other Chinese New year snacks if you bought them. Hi guys! If Tsuki is climbing or going up the mountain ( wearing the same suit as the Yukiyama residents – the brown suit like Sherrif Inu) in Yukiyama, just let Tsuki be. And it should take about a day for Tsuki to climb and you will find a new talkable (heart) character there. However, I’m not sure how long Tsuki will be at the top of the mountain. Beware though, you only get one chance each red packet because the red packet icon disappears once you close the items tab. You will receive the carrots in the increments of 50. Enjoy the Chinese new year. At Yukiyama, I bought skis already but when Tsuki will play them? I wait until 2 days but nothing happen or should I do something? @chivinitz It happens randomly. You’ll know it when you’re able to scroll the items WAY beyond the last item you’ve got. When that happens, there’s the 2nd part that needs planning. It’s better shown on video. I will need to put up one on Youtube. Lolz. Seems like the blowing bubbles diary entry comes randomly. Just got it today… Still waiting for tsuki to go skiing. Today my tsuki going up to the mointain wearing straw cloak and i let him be because maybe he would meet bobo’s grandfather. But minutes ago i found tsuki drowning on the snow and there’s no way to anywhere but back to yukiyama. I couldn’t find bobo’s grandfather. As mentioned above: you need the ice pick and once at the bottom of the cliff, just have to wait to start to climb it. The climbing part is long. I talk to him and now he is purple hearted. Does anyone know how long will i be there? I wasn’t excepting it i’m so glad ! You can get « Fish the police » diary entry just by opening the game. No need to get caught by Inu while fishing in the morning. 10 diary entries to go. Where are they?! One trick for you guys. When Inu aka the sherfif asks whether there is anything suspicious, just say it is in the onsen. Then Inu will be distracted rushing there to have a check. You then can fish at day time without being caught by Inu. Came back to yukiyama once again and while I was sleeping, tsuki went skiing so I got a diary entry. Hoping to get sheriff inu’s heart to red. This is only Day 2 for Tsuki in Mushroom Village. He had 1000 carrots this morning but the Train Station is still closed. Any idea on which day it will open or under what circumstances will it be opened? Are the train and bus tickets only on sale at the store at the Train station or Yori’s Shop? How do you take a photo using the polaroid camera? Does anyone know yet what we do with the telescope? have u gotten all the gachapon toys? i havent yet but i have a feeling it’ll unlock 1!! Did anyone get a gift from sheriff Inu? I have a red heart with him, but no gift. Also did anyone make friends with Bobos grandfather yet? I have only visited once so far. I have 72/90 entries, maybe we have some different ones Mary? With the telescope I got a diary entry in Yukiyama at the onsen! I got it automatically. At last the UFO diary entry! Take a picture of the stars way past midnight (2:15 when I took it) above the onsen. @becca not sure which ones we got similar though. I just got the car diary entry today! Finally. @Mary that’s true! I’ve been to Yukiyama 5 or 6 times now, but only up the mountain once. Does anyone know who Ken’s friend is that moved far away? Hey with the new update, I got all the toys. Too bad it would have been fun to find them. And there are now 106 entries in the diary. Though I’d like to climb the mountain, can’t wait to go back to the village. @Adrienhb 106 entries?! I thought I was going to fill up my diary soon and now they’ve added more oh no. @SakiH I tried to recycle but nothing happens too. But you can still sell them at other shops for 1 carrot if you’re low on carrots. The new wallpapers are very interesting. And there are new items in yori’s shop: a pinwheel and a kendama. @SakiH & Anonymous that could be possible as well. Maybe he will appear soon…. code: 22divide7 worked for me! good luck! You have to recycle at least 200 items to see something changing on the recycle machine. With more than 2000 items recycled my bar is half full. Oh and I still have toys to find, it was a bug. Good ideas about Kens friend! I thought it also could be Bobo’s brother as he moved away? @Adrienhb thanks for info about recycled items!! I am still getting all the Gacha toys showing up- they aren’t there when I first open the menu, but after I’ve swiped through, when I swipe back they have all appeared. This is my 6h trip to Yukiyama. And it is driving me crazy that Tsuki is not climbing the mountain. I have already bought the pick axe and straw wear…. just climb Tsuki, Climb! @Becca – you’re right! It could be Bobo’s brother too! Is there any point in buying the headphones or cell phone in the Great City? Trying to figure out what to focus my carrots on. I have unlocked two diary entries with the phone. With the headphones I once saw Tsuki using them at NMV in the city, maybe taking a photo of that may get diary entry? I didn’t have a camera at the time, so I’m not sure! There is a new character in the city walking by the shops called insurance dog, he gives up to 300 carrots in return for watching an ad!! If only I had known that before! Lately i didn’t see the trenchoat bear in the city. Where could he be? I am happy that it help all of you :D, hope that it will work out and your Tsuki finally climb this mountain ! So frustrated! I still haven’t “climbed” while visiting Yukiyama. My Tsuki was standing reading the post and I closed the app. A few hours later he was in a different part of town. I own the cloak and all the items. I also just bought the car, but no diary entry yet. The only way to befriend somone is tapping until u reach the red heart? I’ve played this game for about a few months and climbed the mountain.. It’s still hard to befriend the grandfather (What was his name again?) ’cause I can’t meet him often..
@Jessica I didn’t get any diary entry when I bought it or these days.. ;; And in my experience, tsuki started to climb the mountain and couldn’t go forward when he met the cliff. I guess you’ll need the straw cloak and the ice pick. I don’t know what conditions make tsuki climb the mountain, but I’m not going to the yukiyama ’cause of the items in the city and the card.. still didn’t get the card from the bar..
Also pakku says that there is a jellyfish in yukiyama… has anyone caught a jellyfish yet? Correction: you can’t just buy some of the stuff. A lot of the entries require you to remodel the home and add a 3rd floor or a kitchen, which you have to recycle to open that option. For example, I had to recycle somewhere around 20000 to get a kitchen. Then, in the Great City, I found a Keureg coffee maker and bought it. When I got back, Tsuki had coffee and it was logged into the diary. Did anyone fill the recycling meter yet? I have lit two lights on the side, still 3 to go… how I wish I didn’t sell all my junk before the update… it’s going to take ages! I think this must be how you get an extra room? Back to fishing….! Sorry! Just saw last message! Thanks for info @anonymous!!! @Anonymous the pucky gives you a diary entry, you just have to wait for tsuki to eat it. You have to keep talking to pakku to get his heart to change colour even if he has the same dialogue everytime. If I didn’t remember wrongly, if you buy instant noodles from the city or yori (forgot which one) it will give you. Diary entry when tsuki eats it. I’ve seen on a YouTube tutorial that the ghost appears at 1.59am you may try? And If you wait till 3.50am, they say you might catch a thief near your Bathtub but you have to talk to Ken to get the dialogue about the thief first. Just realise after the latest update, Jasper not only has front view but both side view as well so cute!!! Side note: after I updated my app, my recycling bar suddenly appeared to be 3/4 filled up. So if yours doesn’t look filled up, maybe just update your app. Hi! can someone tell me about the ufo? I have been to Yukiyama a lot of times and hadn’t appeared. thanks! You can see the ufo in the onsen when it’s about 3a.m in the morning! I’m talking about the onsen where Jun is there all day long..
Purchase a hang glider from the Great City. Use it at the top of the mountain. If you wait long enough before checking on Tsuki again, he crash-lands into the frog’s presidential suite in the Great City, which is another diary entry. The lil hardware store next to geisha bar sells wallpaper for tsuki’s tree home. In the Great City insurance dog shows up every 30 minutes, and gives you 300 carrots for watching 15-30 seconds ad. You can make a lot of carrots while in a city that way, just com back to the game every 30 min.